每个thread中都存在一个map, map的类型是ThreadLocal.ThreadLocalMap. 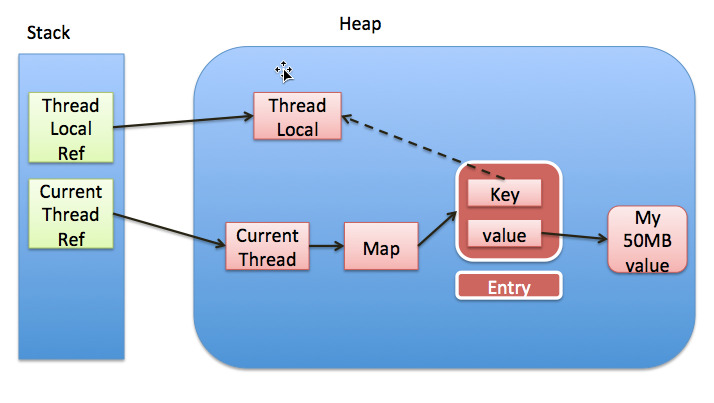 Map中的key为一个threadlocal实例. 这个Map的确使用了弱引用,不过弱引用只是针对key. 每个key都弱引用指向threadlocal. 当把threadlocal实例置为null以后,没有任何强引用指向threadlocal实例,所以threadlocal将会被gc回收. 但是,我们的value却不能回收,因为存在一条从current thread连接过来的强引用. 只有当前thread结束以后, current thread就不会存在栈中,强引用断开, Current Thread, Map, value将全部被GC回收.